Eagle Law Offices Recognized by Peers | Eagle Law Offices, P.S. 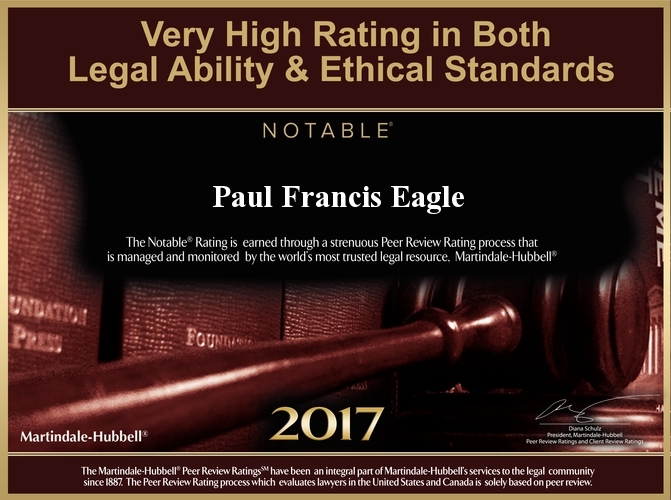 Eagle Law Offices is proud to have been recognized for a very high rating in both legal ability & ethical standards. The notable rating is earned through a strenuous Peer Review Rating process that is managed and monitored by the world’s most trusted legal resource, Martindale-Hubbell. The Martindale-Hubbell Peer Review Ratings have been an integral part of Martindale-Hubbell’s services to the legal community since 1982. The Peer Review Rating process, which evaluates lawyers in the United States and Canada, is solely based on peer reviews.